Nolen's has been a family owned bridal salon and tuxedo rental store since 2002 providing fine bridal gowns and formal tuxedos located in Bryan, College Station Texas and serving all Central Texas. We can help by giving personal attention in helping you choose a wedding gown, a prom, quinceanera, bridesmaid or flower girl dress and a prom tuxedo or wedding tuxedo rental. Formal accessories are also available. The company was founded by Stella Nolen Stella speaks Espanol. 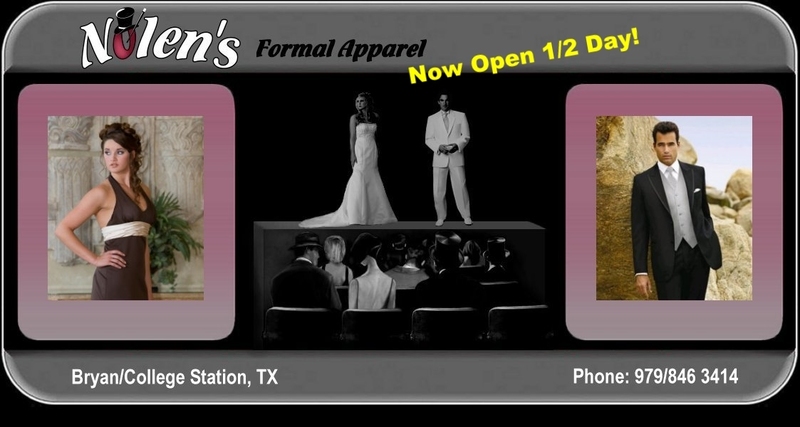 Nolen's offers quality formalwear and formal apparel including tuxedo rentals to people in Bryan Texas and in College Station, Texas. Bryan, TX and College Station TX are located in Brazos County in the Central Texas area. So if you live in College Station, Brenham, Austin or Waco, TX, we are close and can service your needs as well. Nolen's can help you choose a bridal gown or a wedding dress, a prom, homecoming, quinceanera, bridesmaid, flower girl, or a special occasions dress. Let us help with prom tuxedos or a wedding tuxedo rental. Wedding dresses and tuxedo rentals is our business. We also offer wedding dress and formalwear alterations. Along with everyday competitive low prices, we also offer attractive closeout pricing on discontinued dress styles, prom tuxedo rental specials and budget priced prom dresses. We offer discounts on wedding packages. Bridal gowns used in fashion shows are usually like new and sold at bargain basement prices. Discounts offered on a bridal package, mean prices are always very low on tuxedo rentals wear and men's accessories. Men's formalwear and ladies formal attire are always at low prices when you shop at Nolen's. So, if you are looking at bridal shops in Bryan or in College Station TX and you a bride or a groom. You are you going to be in a prom or a quinceanera and are looking for a prom dress, a quinceanera dress, or if you are you just looking for a formal dress and formal accessories. If you have you ever said to yourself, I am looking for, or where can I find?, or who has?, or where can I rent? a groom's, groomsman, father of the bride or, junior groomsman tuxedo? Or, if you have you ever said I want to find a wedding gown, bridesmaid gown, junior bridesmaid dress, flower girl dress or, mother of the bride dress? Then Nolen's is the bridal salon to shop because it is the best bridal shop and tuxedo rental store in the area. Don't forget, after your event, we can also help with gown and dress preservation. We carry a wide range of ladies wedding accessories like wedding veils, birdcage veils, visor veils, French veils, lady's formal hats, cocktail hats, bridal hats, tiaras, headbands, hair cips and hair combs, gloves, petticoats and garters as well as dyeable and non-dyeable wedding shoes. Our women's accessory line also includes formal dress shoes, formal handbags, formal purses, shawls and wraps as well as an extensive formal jewelry line with anything needed for that special occasion. Men's accessories for your designer tuxedo include items such as, canes, dress shoes, vests, suspenders and cummerbunds, pocket squares and ties. Fedoras and top hats are available for your special event. If you are looking for a self tie bow tie or a straight tie, we have it. A full line of dress shirts are available from peak collar to lay down collar with French cuffs. Now let us help with cufflink sets, cufflinks and studs for that shirt.